Mrs May says she will form a government with the Democratic Unionist Party from Northern Ireland, which won 10 seats. Can Theresa May stay as PM? Brexit delays over UK hung parliament? 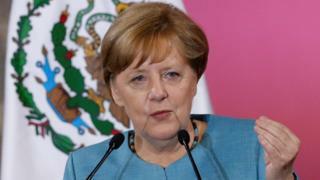 Mrs Merkel, who is meeting with Mexican President Enrique Pena Nieto to discuss trade, told reporters gathered in Mexico City on Friday: "I assume that Britain, from what I heard from the prime minister today, wants to stick to its negotiating plan. "We want to negotiate quickly, we want to stick to the time plan, and so at this point I don't think there is anything to suggest these negotiations cannot start as was agreed." Mrs Merkel, the EU's most powerful politician, went on to say she hoped the UK would remain a good partner. "Britain is part of Europe, even if it will no longer be part of the European Union." However, she added the EU countries would be "asserting the interests of the 27 member states that will make up the European Union in future" during negotiations. Meanwhile, Michael Fuchs, senior economic adviser to the German chancellor, told the BBC the result meant it was time for Mrs May "to face realities" and soften her approach. "Her wish and will was not really too much accepted by the British people," he said. "I have the feeling, because otherwise they would have given her a better vote. "Maybe, this is a chance that we can come up to a more reasonable Brexit negotiations because in the last time (recently) I really had the feeling that everything was just being very tough and it doesn't make sense to be tough. "We want to have a fair deal with Britain and we want to have a fair final Brexit negotiations." Other EU leaders have expressed concerns the failure to win a majority may make negotiations even more difficult. Brexit negotiator Guy Verhofstadt, who is president of the Alliance of Liberals & Democrats for Europe in the European Parliament, had caustic words for Mrs May. "Yet another own goal, after Cameron now May, will make already complex negotiations even more complicated," he tweeted. Jean-Claude Juncker, head of the European Commission, said he wanted discussions to proceed without delay, while Michel Barnier, the EU's chief negotiator for Brexit, said "negotiations should start when UK is ready". European Council President Donald Tusk alluded to the March 2019 deadline for Brexit talks. "We don't know when Brexit talks start. We know when they must end. Do your best to avoid a 'no deal' as result of 'no negotiations'," he wrote. Election results 2017: What does it mean for Brexit? Election results 2017: Could the Democratic Unionist Party be Westminster kingmakers? UK election result: What does it mean for Brexit? Election results 2017: Who are the DUP? Video General election 2017: Goodbye and Hello - who has a seat? General election 2017: Why did Theresa May call an election?